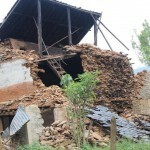 The 2015 Nepal earthquake struck Nepal on 25th April with a magnitude of 7.8, followed by aftershocks including a large magnitude 7.3 quake on 12 May. The initial earthquake struck with an epicentre in the mountains to the northwest of Kathmandu, and aftershocks around the city of Kathmandu. The later 7.3 earthquake struck to the northeast of Kathmandu towards Mount Everest and affecting regions in Southern China. The quakes killed at least 8000 people, and left many in desperate need of shelter, medical help, food and other aid.